Sixty firefighters have tackled a house fire which badly damaged a Grade II* listed property in Hampshire. Fire crews from Hampshire and Wiltshire were involved in the operation at Appleshaw near Andover. 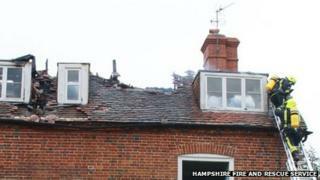 Hampshire Fire and Rescue Service said the roof of the family home was "well alight" when they arrived. The property also sustained extensive water damage. No-one was injured in the blaze. John Goold, whose family lived in the house, described how he saw smoke billowing when he was in his car buying the Sunday papers. "I thought 'That looks a bit too close to home', and when I got back the family were in the garden in their pyjamas. "There was a lot of smoke and it was pretty scary. I can't overstate how amazing the fire brigade were," he said.